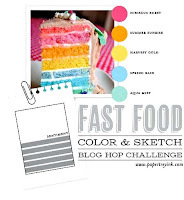 This month, we could choose from some wonderful "fast food" color and sketch combinations. Check out the picture of the one I selected. I used Washi tape for my colored strips at the bottom of the card and then used the same Washi tape to cut my number and little letters. My little secret for that is to cover some white chipboard with the Washi tape first and then die cut it. To finish the card I stamped "happy" and "birthday"around the large number to form the rest of the sentiment. I just realized I meant to go back and add a bit of bling to the card...but I forgot. Before I send it out, I will probably add just a few rhinestones and sequins in similar colors. FUN FUN FUN! 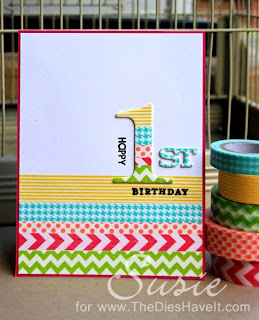 I am also linking this to the Less Is More blog challenge to use Washi Tape on a card. 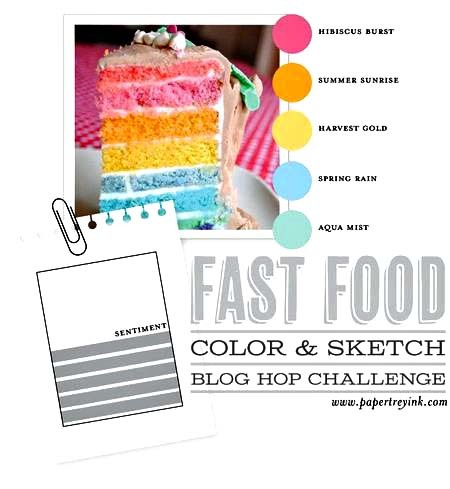 Be sure to click right here to see the challenge and maybe add a card of your own. I'll be back tomorrow with another project to share with you - this time a digital layout. Oh, what a fabulous card! 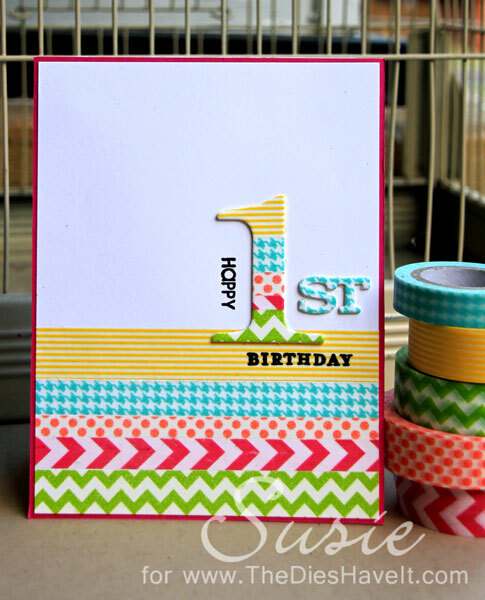 I love how you repeated the strips of washi tape on the "1"-- it looks great! Love the washi tape strips - perfect take on the sketch/color challenge! Susie, this is a Washi masterpiece! I adore it! Hey, Less is More is having a Washi challenge; you should edit your post and enter your card - it's a winner in my book! Susie, this is a great idea , love your beautiful card and the washi tape. Fabulous idea to use washi tape! Love it! Fabulous card... had to pin it for future reference! Looks like the layer cake you used for inspiration. So bright and cheery! Great use of washi tape. Super cute....Love all the washi tape on the number "1". This is a really fun card and a great way to use washi tape! What lovely vibrant tape...a really cheerful card!